This Sundal is very famous in beach and you can hear the voice of young boys selling it as "thenga manga pattani sundal" in Marina beach. They have these daily news papers rolled in small cone shape and kept one over other. 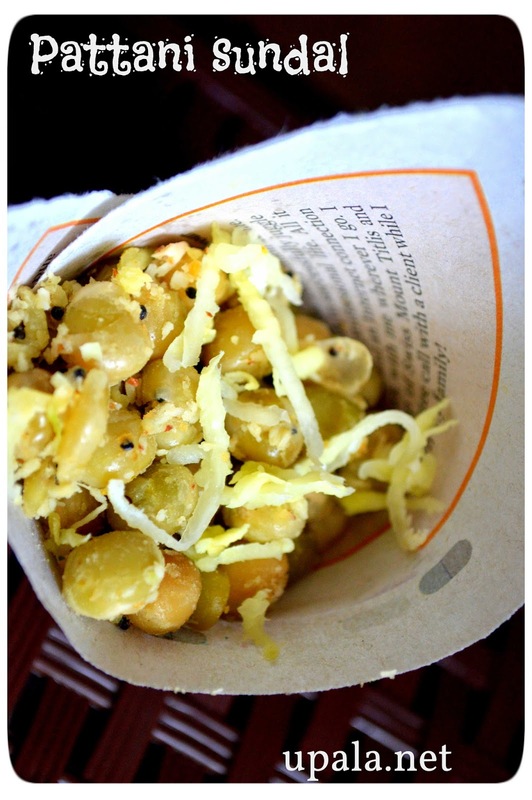 When we ask for sundal, they take one roll and put sundal in it also the highlight is garnishing with grated mango before serving. The same sundal is made during Navarathri days as neivedhyam. 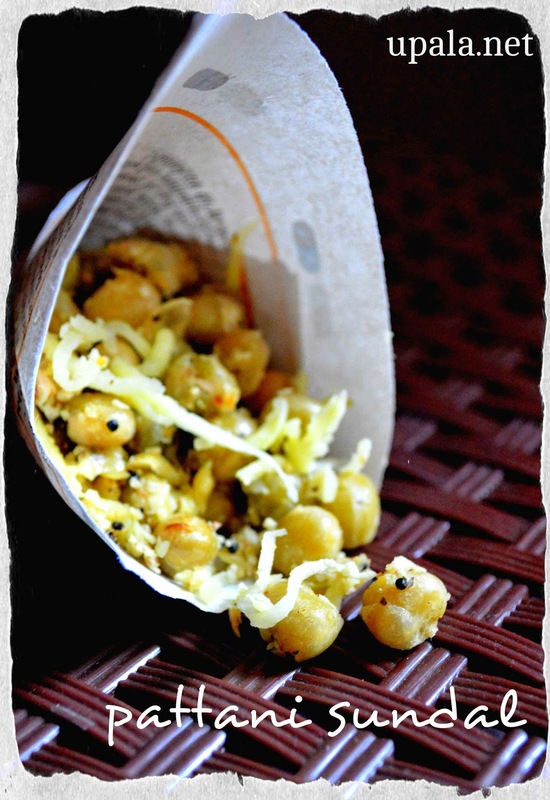 This is one of my favourite tasty sundal....here is the recipe for it. I have used dried green peas to prepare this recipe, you can also use white variety. Generally white variety is used to make beach sundal but both tastes the same. For Navrathri, any one variety can be used. 1) Soak dry peas in water for over night. 2) Drain the water next day and pressure cook the peas. It should be cooked soft enough that when we press the peas with two fingers it should get mashed. 3) Grind the ingredients given in "To grind to coarse paste" with out water and keep aside. 4) Heat a kadai and temper mustard seeds and add curry leaves, asafoetida, cooked peas, salt and ground paste. 5) Mix all the ingredients well and sauté for few mins in low flame. 6) Switch off the flame and add lemon juice. Garnish the sundal with grated raw mango while serving. 1) You can also add finely chopped onions and coriander leaves for additional taste. For Navarathri sundal, onion is avoided. 2) Grated carrot can also be added according to your taste. 3) Some prefer to add grated ginger instead of grinding, it purely depends on your taste. 4) I have already mentioned about the multipurpose curry powder, it enhance the taste of any dish. You can add 1 tbsp of curry powder when you dry grind the ingredients and add. 5) If you use asafoetida powder it blends with sundal but if you use bar asafoetida after tempering just press with fingers to make it a powder and add to sundal.